Every day, an increasing number of individuals are forced to flee their countries because of persecution, war and violence. The challenge of how to be most effective in resettling and integrating refugees is a paramount issue that stakeholders have been working to address incongruently. 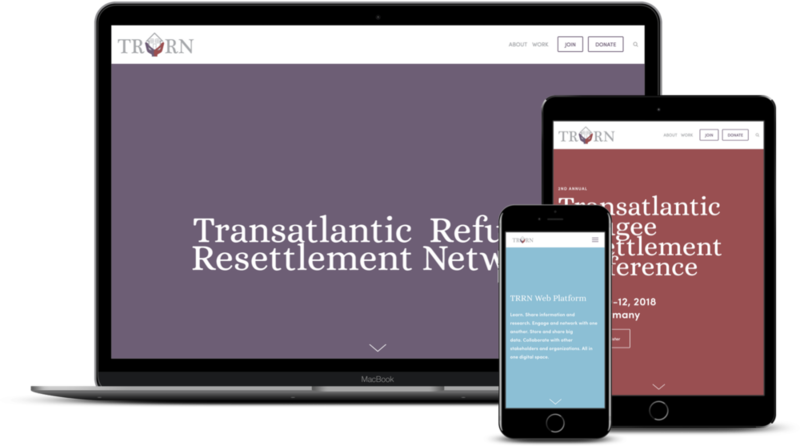 In response, the Transatlantic Refugee Resettlement Network (TRRN) created a network for on-the-ground practitioners, policy-makers, organizations, lawyers, social service providers, law enforcement officials, healthcare providers, researchers, governments, advocates, and other stakeholders working to resettle and integrate refugees and measure impact. Through communication and collaboration, they seek to accelerate the acquisition and sharing of knowledge across borders and thereby highlight and promote best practices, new research, and promising innovative ideas. Currently, the Network plans regional events and one annual conference that bring stakeholders together to share, discuss, and collaborate. The Network is in process of expanding their network into the digital space. In their inception, the Transatlantic Refugee Resettlement Network approached FN Creative Console to create a logo and some marketing materials (see below for some samples). However, as they began distributing their materials, they realized that a website would be most effective for spreading the word and creating mechanisms for engagement. FN Creative Console built a site that not only effectively communicates the vision and work of the Network, but also one that can grow to manage all their upcoming events, conferences, and digital needs. The site creates a clean and simple, post-modern vibe, one that feels like a room full of people you want to sit and have a conversation with. In addition, the site provides the back-end prowess that will allow the Network to create an interactive digital platform, which will serve as the official home for the network. In a time when information, research, and data are being produced at such high speeds, the field must keep up. This platform will enable refugee resettlement stakeholders to stay in the loop on ground-breaking research, communicate quickly and effectively as new and uncharted issues arise, and stay in contact with individuals they meet at events and create new contacts within the refugee resettlement sphere. FN Creative Console is currently building the platform. Stay tuned for the official launch! A Concept Note for the TRRN - click on the image to open the document.